Britain's Prime Minister Theresa May leaves after attending a church service near her Maidenhead constituency, west of London. The British Prime Minister on Sunday warned MPs preparing to vote down her EU divorce deal that failing to deliver Brexit would be a "catastrophic and unforgivable breach of trust in our democracy". British Prime Minister Theresa May on Sunday warned MPs preparing to vote down her EU divorce deal that failing to deliver Brexit would be a "catastrophic and unforgivable breach of trust in our democracy". May, who is fighting to save her withdrawal agreement negotiated with the bloc over 18 months of talks, told lawmakers they must not let down Brexit-backers in a crunch parliamentary vote Tuesday. "Doing so would be a catastrophic and unforgivable breach of trust in our democracy," May wrote in the Sunday Express. "So my message to parliament this weekend is simple: it is time to forget the games and do what is right for our country." Britain is set to leave the European Union on March 29 but has yet to finalise the terms of its departure. 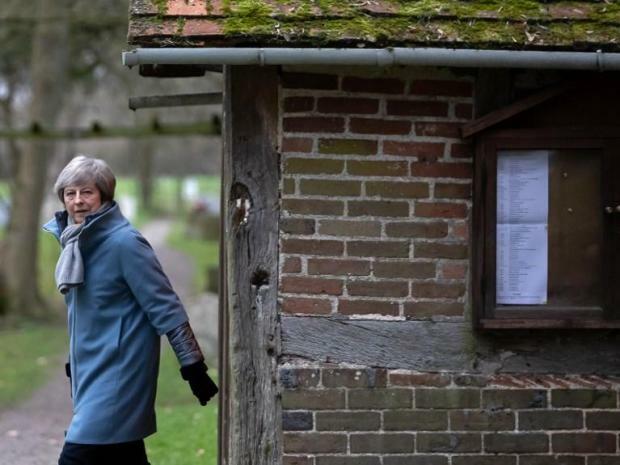 The prime minister has already postponed a House of Commons vote on her plan once -- in December -- to avoid defeat, and looks certain to see it rejected by MPs on Tuesday amid fierce opposition. Lawmakers fired ominous warning shots this week, voting to force May to quickly set out an alternative plan for Brexit if it is beaten. It was the second setback in 24 hours for the prime minister, after MPs also voted to deny the government certain taxation powers in a no-deal scenario -- an attempt to scupper that prospect. The Sunday Times reported a group of senior cross-party backbench rebels are now plotting to change House of Commons rules to enable them to override government business if the deal falls. Described as "a very British coup", the plan would see May lose control of parliamentary business to MPs, threatening her ability to govern, according to the newspaper. It said Downing Street was "extremely concerned" about the possibility, which could see lawmakers then delay Brexit through new legislation. Conservative MP Nick Boles, who favours a Norway-style relationship with the bloc instead of May's plan, told the paper he was exploring tactics in the Commons to rule out no-deal. "We have a mechanism which will give parliament control of the Brexit negotiations and ensure we do not leave the EU without a deal on March 29," he said. "I am working on ways to achieve that outcome," Boles added, noting he would publish the plan on Tuesday.